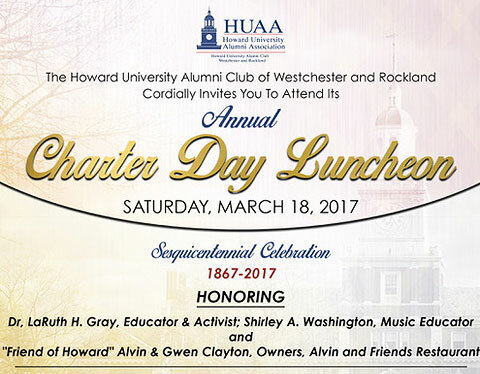 The Howard University Alumni Club of Westchester and Rockland will host its Annual Charter Day Luncheon on Saturday, March 18, 2017 to celebrate the founding of Howard University and honor distinguished local Howard University alumni. Mail: Please make checks payable to HUACWR and send to our mailing address below. Tickets should be paid for by 3/11 for $90 rate.